US: UPDATED - Portland man indicted on 2 federal charges of aiming at aircraft | Laser Pointer Safety - News of aviation-related incidents, arrests, etc. 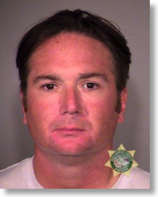 PORTLAND, OR—Stephen Francis Bukucs, 39, a resident of Northeast Portland, was arrested in Portland on Friday evening, October 18, 2013, on charges of aiming a laser pointer at two aircraft. A federal indictment unsealed this morning by the court alleges Bukucs aimed a laser pointer at United Airlines Flight 1406 and JetBlue Flight 1205 in Portland on October 13, 2013. Bukucs is being held in custody at the Multnomah County Detention Center and will have his first court appearance today at 1:30 p.m. before U.S. Magistrate Judge Dennis M. Hubel for arraignment on the indictment. Knowingly aiming a laser pointer at an aircraft is a felony offense under federal law, carrying a maximum sentence of five years in prison and a $250,000 fine. The arrest is the result of a joint investigation by the Federal Bureau of Investigation (FBI), the Federal Aviation Administration (FAA), the Port of Portland Police, and the Portland Police Bureau. The Transportation Security Administration (TSA), the Washington County Sheriff’s Office, and the Clackamas County Sheriff’s Office also provided substantial assistance. An indictment is only an accusation of a crime, and a defendant should be presumed innocent unless and until proven guilty.